Spring is coming in Vermont & we are enjoying the seasons changing! The snow is melting, the birds are chirping & the steam is flowing out of sugarhouses throughout Vermont. 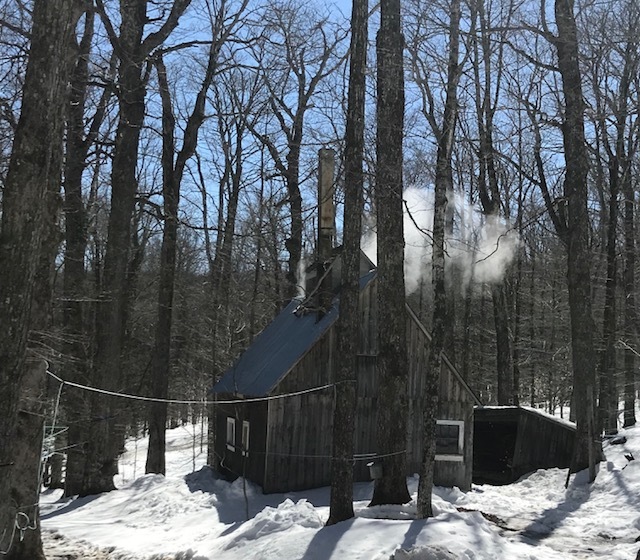 As new transplants in Vermont, we are learning that maple sugaring is an important part of the heritage of Vermont families. 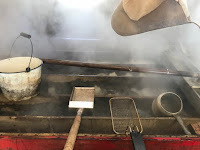 We hope you enjoy this blog all about maple sugaring! The sap is made as the tree mixes groundwater with the sugar. The sap is mostly crystal-clear water with about 2% sugar. 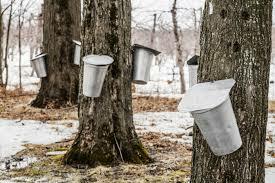 It takes about 50 gallons of sap to make one gallon of maple syrup. A typical sugaring season lasts 4 to 6 weeks. A pattern of freezing and thawing temperatures (below freezing at night and 40-45 degrees during the day) will build up pressure within the trees causing the sap to flow from the tap holes. There are two different ways to collect the sap from the trees. The oldest method is with sap buckets which are attached to trees & must be gathered by hand. The sap is then transferred to a gathering tank which is used to transport the sap to the sugarhouse. The modern way to collect the sap is through pipelines attached to trees, the sap flows naturally through the pipelines to the tank at the sugarhouse (in some cases a vacuum pump is used to move the sap through pipelines). The sap is then drawn into the evaporator which is in the sugarhouse. At the sugarhouse we have partnered with, they use a wood fire under the evaporator to boil the sap. As the water in the sap evaporates, the sap thickens into the syrup. Even though it looks like the finished product it will still need to be filtered and graded for flavor and color. An interesting fact about Maple Syrup is that the grade is different every year as the quality of the sap determines the grade of the syrup. The Wilmington Inn recently partnered with the May Family Sugarhouse for maple syrup. 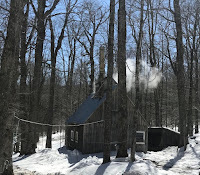 Over Easter weekend I had the chance to take some friends and their children to see this sugaring process and what an amazing lesson it was. I learned so much and the kids loved it too. During the sugaring season, our guests can go visit the sugarhouse & experience how to make maple syrup! The pictures in this blog are from this recent visit to the May Family Sugarhouse! Like whitewater rafting? 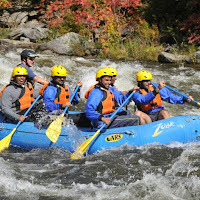 Stay with us overnight on May 5th or 6th & go rafting with Zoar Adventure! 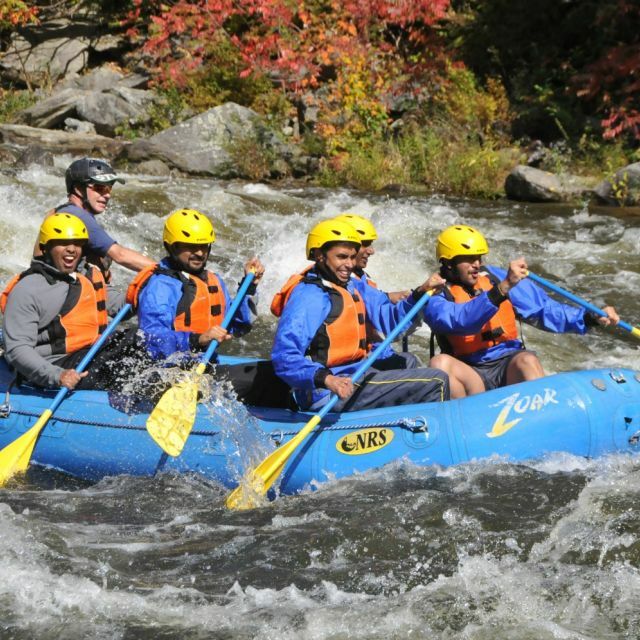 Contact Zoar to book rafting- mention you are staying at The Wilmington Inn & you will get 10% off! We look forward to seeing everyone again this year! Don’t forget to check out our packages for 2018!